Returning to work after maternity leave can be difficult and filled with mixed emotions, even for the most organized of moms. Finding a good caregiver, adjusting to your previous work schedule, and getting yourself and baby ready each morning are just some of the challenges that many new moms face. With a little planning, you can be back on top of your game in no time. Below are a few tips to help make your transition back to work seamless, for both you and your newborn. Baby talk – the soft gurgles, squeals and sounds that babies make before they utter their first words – plays an important role in babies’ language development. Scientists say that parents can help their babies to develop language skills by talking to them. In a recent study conducted at the University of Washington, scientists played a recorded series of syllables, similar to that of “baby talk” for babies between 7 and 11 months old, and found that the babies’ brain activity surged as a result. 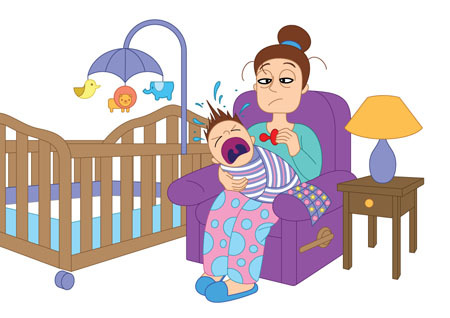 Most moms with a newborn experience and are anxious to progress beyond the agony of sleep deprivation. Early on, often newborns eat frequently, sometimes as often as every two hours. Unless you have a helper who can handle several feedings in a row, you’re unlikely to come close to a “full night” of sleep until baby is closer to 2 to 3 months old. A recent article in The New York Times caused a stir online and, possibly, in many households, too. The article, “The Trauma of Parenthood,” cited recent studies linking new parenthood to depression. Although this is commonly referred to as “postpartum depression,” The Times article said that the depression the studies identified were not hormonal in nature. Rather, the studies linked depression to the activity of parenting and noted that both men and women have similar experiences. Parenting can be an all-consuming labor of love. With time, you can get back to feeling like “you” again.